As for specifications, this phone has a Snapdragon 820 processor, 4GB of RAM, 64GB of storage, 13MP/5MP cameras, and support for all 'Moto Mod' modular add-ons. The main downside to this phone is the battery life - the 2,600mAh battery is fairly small. There's also no headphone jack. 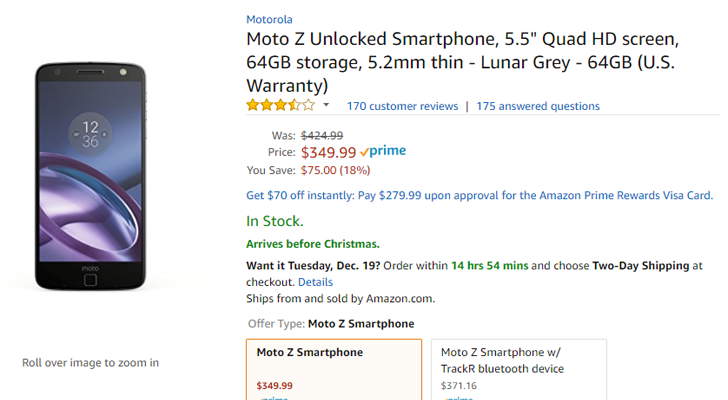 You can buy the Moto Z at the source links below. Keep in mind that B&H doesn't collect sales tax outside of New Jersey and New York.